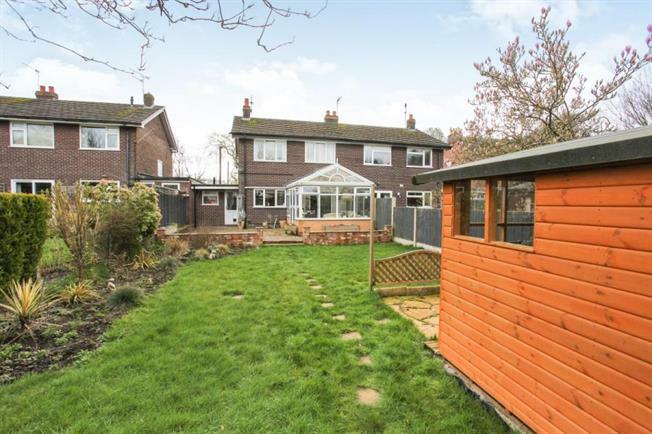 3 Bedroom Semi Detached House For Sale in Stoke-on-Trent for Offers Over £210,000. FEATURED IN THE BIG OPEN HOUSE WEEKEND 27th & 28tH APRIL. PLEASE CONTACT THE BRANCH FOR MORE DETAILS Set back from Crewe Road along a small unadopted lane this spacious 3 bed semi-detached property offers great family size accommodation. Located approx 1 mile from the Town Centre this particular position enjoys quick road access to the M6 or the A500, as well as being within walking distance to schools and local Town Centre amenities. With plenty of off road parking there's no problem for when guests visit and you have the additional space of the garage too. Internally the accommodation is perhaps larger than you would imagine and comprise Hallway, guest WC, Lounge/Dining Room, Kitchen, seperate utility room with access to the Garage, three spacious bedrooms with some having fitted wardrobes and the main bathroom. We have yet to mention one of the main features on offer, this being the extensive enclosed and established rear garden, which enjoys mature surroundings, the long lawned area is ideal for children and pets. NO CHAIN.